The eyes of the common moth have led to a novel discovery that could boost the efficiency of solar panels. Scientists at Brookhaven National Laboratory have developed a way to create an ultra-tiny texture on silicon (which is the most common material for solar panels) that cuts down on a solar panel’s reflection in the same way that a moth’s eyes operate. A moth’s compound eyes have textured patterns made up of tiny posts, with each one smaller than the wavelength of light. When light hits the moth’s eye, much of it is absorbed and passes into its cornea without disruption. The moth’s eye evolved in this way so that it could see better at night, and so that its eyes wouldn’t glimmer and attract predators. 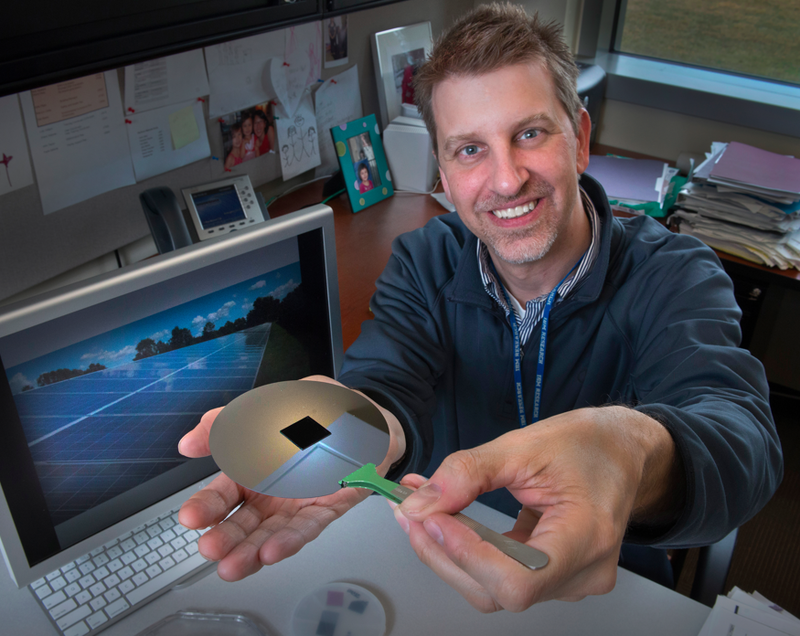 Chuck Black of the Center for Functional Nanomaterials displays a nanotextured square of silicon on top of an ordinary silicon wafer. The nanotextured surface is completely antireflective and could boost the production of solar energy from silicon solar cells. 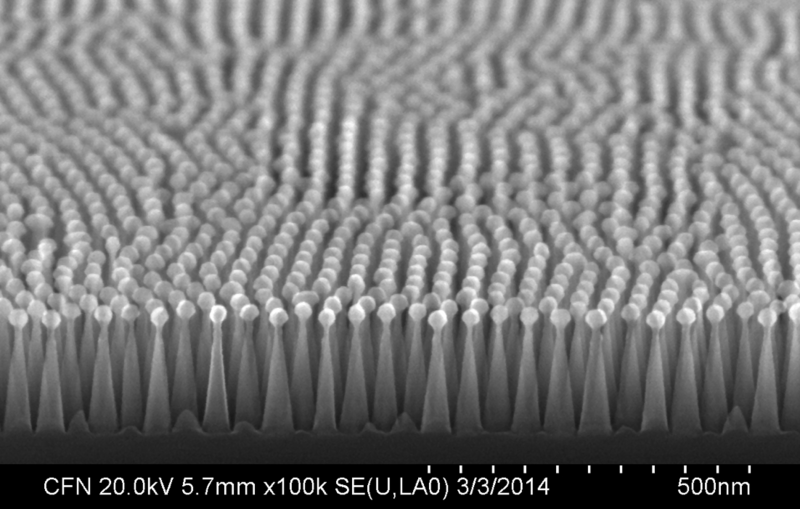 While mimicking moth eyes to create anti-reflective surfaces is quite common (glare-free TV screens, other solar cell research) the scientists at Brookhaven used a polymer material called a “block copolymer,” which can self-organize into tiny patterns, to create a template for texturizing the surface of a silicon solar cell (solar cells make up a solar panel). Companies use self-assembling block copolymers to make things that need a textured surface, like the soles of shoes and adhesives. 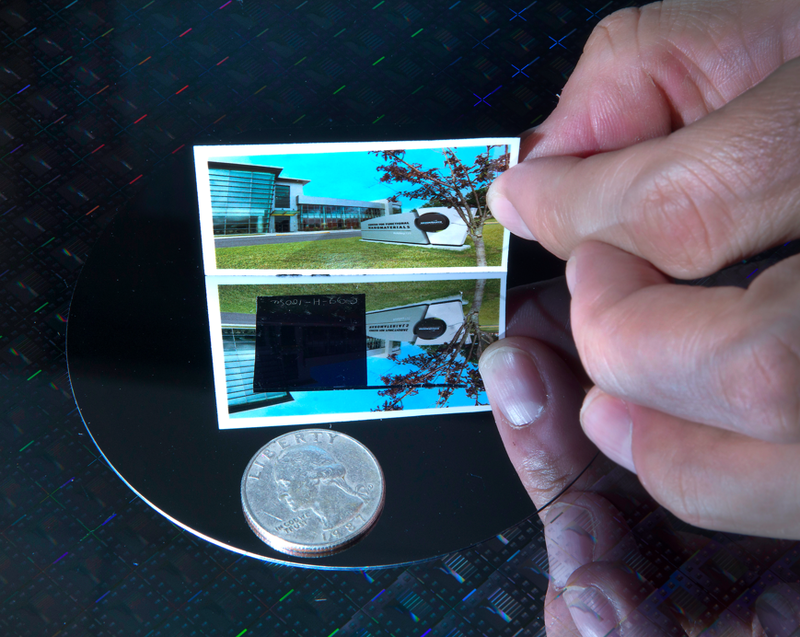 A closeup shows how the nanotextured square of silicon completely blocks reflection compared with the surrounding silicon wafer. The scientists then used the block copolymer texture as a template for creating the tiny post patterns in the silicon solar cell using a plasma of reactive gases. The chip industry commonly uses this method to manufacture electronic circuits. Details of the nanotextured antireflective surface as revealed by a scanning electron microscope at the Center for Functional Nanomaterials. The tiny posts, each smaller than the wavelengths of light, are reminiscent of the structure of moths’ eyes, an example of an antireflective surface found in nature. The scientists discovered that simply texturizing silicon solar cells in this way could cut down on the reflection of the cell and make it more efficient than the anti-reflective coatings commonly used today by solar cell makers. The scientists say their method outperforms a single layer of anti-reflective coatings by 20 percent. They’re still looking into how this could be a cost advantage as well. Brookhaven National Laboratory is funded in part by the the Department of Energy Office of Science. Physicist Charles Black led the moth eye research via Brookhaven Lab’s Center for Functional Nanomaterials (CFN). The research was recently published in the journal Nature Communications and submitted for a patent. The findings could have more applications for making anti-glare windows and boosting the brightness of LEDs.